FTP or File Transfer Protocol is an application layer protocol widely used for file transferring in a client-server architecture design that relies on TCP/IP network layers. 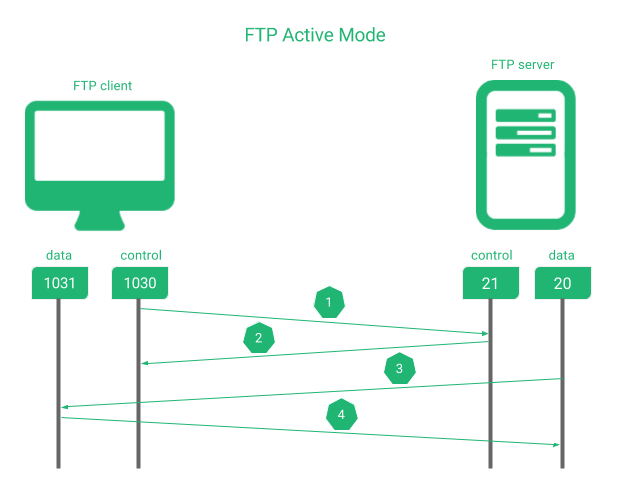 FTP is a complex and plain (no security aware) protocol which ports used are negotiated at application layer between the client and the server, so that it’s a little bit difficult to load balance or create firewall rules. 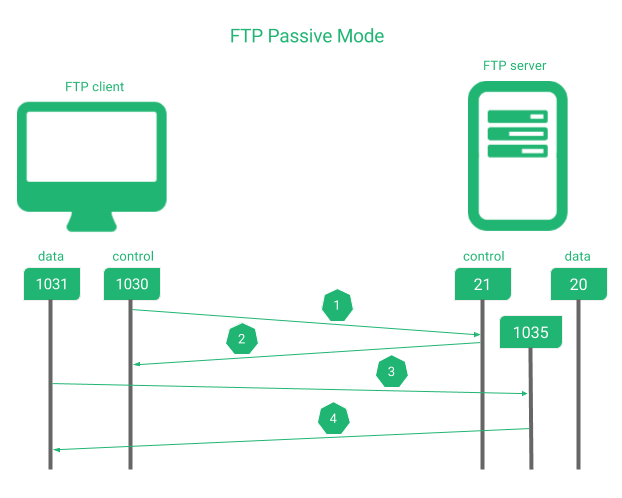 In addition, FTP server and client could behave in active or passive modes, that could be described below. Some features that provides FTP are: 2 TCP ports (20, 21 by default) used one for control commands and another for data, authentication mechanism support, no ciphering support, ascii and binary transferring, broad commands available (directory listing, directory browsing, upload files, download files, etc.) and inherent TCP resilience. TFTP or Trivial FTP is a variation with a faster file transferring and simpler architecture design that uses just one UDP port (69 by default), no authentication mechanism support or ciphering, three transferring modes available (netascii, octet and mail) and only basic commands like upload and download files. 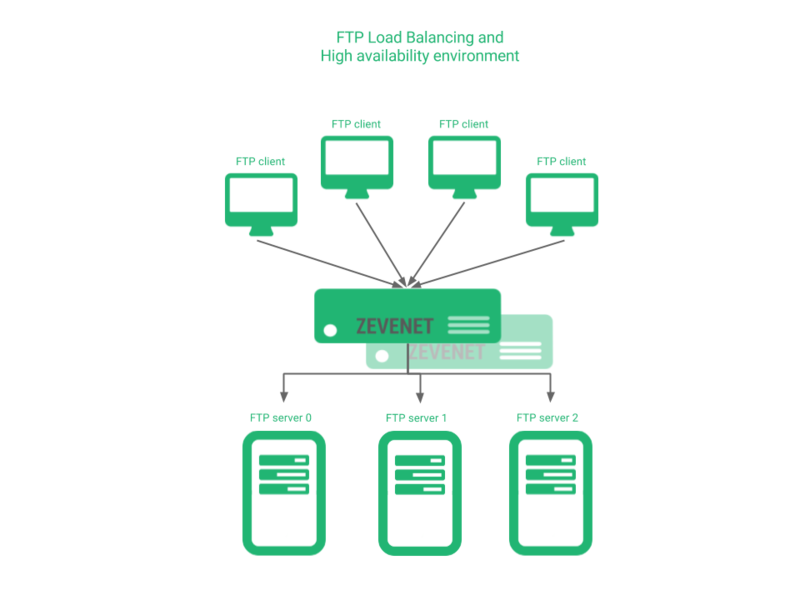 Both FTP and TFTP services can be load balanced easily with Zevenet Load Balancer. Keep reading to know how to achieve it. The scenario that we want to achieve in this article is shown in the diagram below. Either there is a high concurrency of users and it’s required to scale the service or it’s a critical service that needs to be high available, a FTP service load balancer will be needed. An active FTP setup will require to use the ports 20 and 21 in the servers or backends side. The picture below shows how the connection flows when a data is required to be transfered between a client and a FTP server. 1. The client requests to the server via port 21 a command. 2. The server acknowledges to the client. 3. The server initiates the data connection using the data port 20. 4. The client acknowledges to the server when it’s finished. At this point, we’ve to setup a load balancer between both client and server and then takes care about the traffic flows, connections initializers and port agreements between client and server. With Zevenet Load Balancer, we’ve to achieve this kind of configuration creating a LSLB farm profile L4xNAT with ports 20,21 and FTP protocol, as it’s shown in the picture below, and finally set the backends (not required to set the ports). The clients have to connect to the VIP address of the new FTP farm. Note: This configuration is save to be used for both active and passive client/server modes. A passive FTP setup only uses the port 21 in the servers or backends side. The picture below shows how the connection flows when a data is required to be transfered between a client and a FTP server. 3. The client initiates the data connection using a high data port to an application layer agreed port in server side. 4. The server acknowledges to the client when it’s finished. With Zevenet Load Balancer, we’ve to achieve this kind of configuration creating a LSLB farm profile L4xNAT with the port 21 and FTP protocol, as it’s shown in the picture below, and finally set the backends (not required to set the ports). Trivial FTP protocols are used mainly during PXE (Preboot eXecution Environment) environments that are composed by a combination of DHCP and TFTP services, where tens, hundreds or even thousands of computers can be deployed through the network. 1. The client requests to the server via port 69 a Read Request (RRQ) or Write Request (WRQ) command including the file and transfer mode. 2. The server acknowledges to the client and notify the new data port to be used. 3. The client initiates the data connection to an application layer agreed port in server side. 4. The server acknowledges to the client when the latest 512 bytes are remaining. 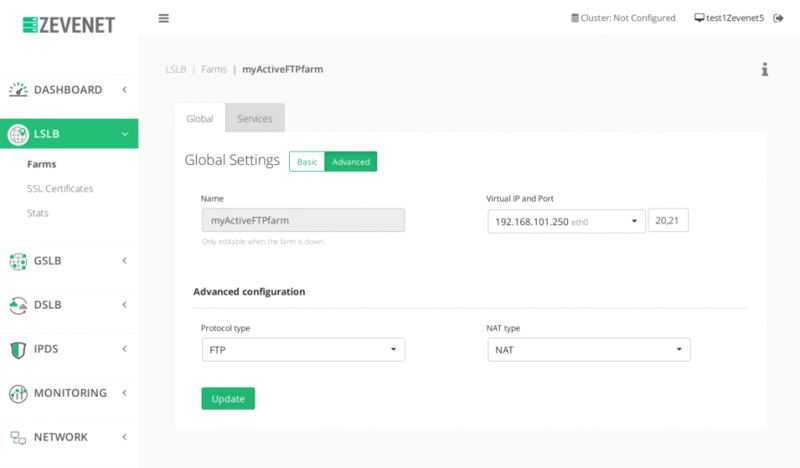 In an environment where the TFTP service needs to scale, the configuration with Zevenet 5 is very easy. It’s required to create a LSLB farm profile L4xNAT with the port 69 and TFTP protocol, as it’s shown in the picture below, and finally set the backends (not required to set the ports). The clients have to connect to the VIP address of the new TFTP farm. In order to solve the enhanced security of FTP protocol, the SSH File Transfer Protocol or better known as SFTP was designed to provide a security layer. In that scenario, the FTP servers should be configured as SFTP and the load balancing of those would be as easy as creating a LSLB with L4xNAT profile farm over the default port 22 and protocol TCP as it’s shown in the screenshot below. Finally, just add your SFTP service backends. The clients have to connect to the VIP address of the new TCP farm, that serves a SFTP service. In the Services tab ensure the configuration of Farm Guardian as shown below. A timeout of 60 seconds would be enough to ensure the correct behavior of a backend. If the check_tftp advanced check doesn’t already exist in the Zevenet appliance, we can create an easy health check script as described below for our TFTP services. Firstly, create a dummy file in your TFTP backends directory, for example tftp_zevenet_check.txt, and add some content, for example “OK”. echo "TFTP health check status for $1 is $RESULT"
TFTP health check status for 192.168.101.254 is tftp> Transfer timed out. Finally, configure the health check in the TFTP farm, including in the command the HOST token. Then, the configuration would shown as it’s shown in the following screenshot. Enjoy your high available and scalable file transferring!